Conrad and Language, ed. Katherine Isobel Baxter and Robert Hampson. Edinburgh University Press, 2016. 219 pp. In March 1940, Les Nouvelles littéraires published an article about Irène Némirovsky (posthumously celebrated as the author of Suite française) under the heading, “Le Conrad français”. In the twentieth century Conrad became a touchstone for those seeking to understand authors who wrote in languages other than their mother-tongue and, indeed, quite often for those authors themselves. And while “Joseph Conrad” is indisputably an English novelist, within his novels the linguistic borders are unusually porous. As the Oxford Reader’s Companion entry on “languages” puts it: “the extent to which multiple languages figure actively and constantly in his literary creations is without parallel in modern English literature.” In this collection of essays, the editors aim to move debates on to twenty-first century concerns of transnationalism and migrancy, disability and polarized politics, while maintaining a firm foothold in the nautical and trading career that so influenced the linguistic range of Conrad’s novels. Baxter and Hampson declare in their Introduction that this collection will follow the line of criticism developed in the 1980s by Jeremy Hawthorn in Language and Fictional Self-Consciousness and by Martin Ray’s two well-known articles in Conradiana (15:2 and 16:1), rather than a perspective primarily informed by linguistics or stylistics. To do so, they have assembled eleven essays by scholars well-known to readers of this journal, which tend to find their grounds of discussion in the social uses of language consciously put on display by the novels, rather than in the linguistic constructions (from French and Polish) less consciously incorporated into the “English” which “adopted” Conrad, as he famously put it in A Personal Record. The eclectic nature of the volume can be seen in the first two essays, in which Robert Hampson first discusses Conrad’s presentation of two rather different sorts of nautical language – the terms used for the various spaces, parts and implements on board a ship, and the range of expletives used by the sailors manning her – and then in “Navigating the ‘Terroristic Wilderness,’” Andrew Glazzard extends the account of “technical language” to the political lexicon, in determining the ways in which the term “terrorist” can be applied to The Secret Agent, Under Western Eyes and The Rover. Such divergence in subject matter ensures that the volume, though with no claims to being comprehensive, makes reference to a wide range of Conrad’s fictional and autobiographical writing, but also indicates that the reader should not expect a steadily and progressively organized deepening of attention to a single or unifying concept of “language” in Conrad’s work. Although the case is not made for it, to consider the languages Conrad learnt by necessity, and met in the way of companionship, during his sea career, can be seen as a good place to start a series of essays that primarily address professional uses of language, rather than unconscious inheritance; and after some careful discussion of “Typhoon” and “The End of the Tether,” Hampson concludes that it is in these mature fictions that Conrad learned the restraint in handling various sorts of technical language which enabled him to reach a non-specialist readership. Glazzard’s well-focused essay looks forward rather than back to the literary outcomes of a nautical career – both to UN committees trying to define “terrorism,” and to “the terrorist novel which flourished in the 1970s, the 1990s and the early 2000s” (35). Starting interestingly with Scevola in The Rover, the essay shows convincingly Conrad’s attention to instrumental and political uses of language that arise “simply because it is required to mediate contention.” A good discussion of Karl Yundt reminds us that in his case “‘terrorist’ is a self-appellation,” although the “moribund murderer” is surrounded by much delightfully figurative oxymoron at the hands of the narrator. Glazzard usefully suggests that Yundt “represents a kind of malign political mischief-making,” though he might have made more of Conrad’s own malicious glee in linguistic invention. Having pointed to the diverse concerns of these essays, it is fair to say also that there are pairs of essays here that do “speak to each other” interestingly, if not explicitly. Chris GoGwilt, for instance, in his consideration of the importance of Romanized print form in stories with such different linguistic settings, provides a highly original entry-point to the following essay, Andrew Francis’s close account of “the complexities of language that characterized the linguistic environment in the Malay Archipelago … when Conrad’s Malay fiction is set” (132). Claude Maisonnat’s exploration of Gallicisms as “The Secret Agent in Conrad’s Prose,” “an indispensable constituent of his aesthetics of writing” (166), is provocatively placed before Andrew Purssell’s “The speech of my secret choice,” a study of the account in A Personal Record of how English contributed to the fashioning of “Joseph Conrad” as “an entity which can be ‘authored’” (181). And although it is clear that the editors have given the contributors a pretty free hand, there are many other places where the reader who wishes to read these essays in conjunction with each other will find moments of contrast or recall, or illumination from an unexpected direction. Broadly, the editors see the middle essays of the volume as taking the discussion towards wider philosophical issues before the final five essays turn to specific languages and their textual appearances, or, in the case of the concluding essay, the significance of translation into a specific language. Beginning with Yael Levin’s essay, we see how for most of the contributors issues of language are also inevitably issues of identity. Levin charts “the refashioning of plot, narrative voice and character” (64), in the light of a passivity which invites invasion, and which she finds a characteristic that unites Conrad’s narrative techniques, some of his characters, and the notion of the “modernist subject”: “Like Marlow, Jim and Heyst are both modernist subjects and as such are open to the invading other and his poisonous language” (71). The essay develops Levin’s claim that “Language happens to the unwitting Marlow; he is a passive receptacle for the words that invade him” (72), and thus prefigures a condition “fundamental to Beckett’s poetics”. Waiting is the paradigm activity depicted by both authors, and the event that this engenders, both creative and paralysing, is language, filling the gap with words. Both Levin’s essay and the following one, by Josiane Paccaud-Huguet, proceed by close, often difficult, argument, with the latter taking the “event” to be “narrative in the act,” seeing it rather brilliantly in Conrad’s hands as a “perlocutionary effect … one of [“Heart of Darkness”’s] agents of unrest” (83). In an essay that makes use of J. L. Austin, Saussure and Lacan, as well as a more recent essay in The Conradian by Anne Enderwitz on Chance, Paccaud-Huguet’s concern is specifically with “The Powers of Speech”: as she says of Lord Jim, “The desire to tell ‘audibly’ means on Marlow’s part an endeavour to transfer affective intensities rather than to dispose of the case” (86), and of Chance, “What Flora has been confronted with is less a question of meaning than one of words loaded with malevolent enjoyment” (87). And yet it is Chance that the essay takes to make us hear, in contrast, the much more mysteriously resonant disturbances of affect that are released by “the intensely shimmering texture of Conrad’s earlier fiction” (91). The essays in the second half of the volume come closer to a historical and linguistic focus on particular languages as they operate in Conrad’s fictions and life, and they stand somewhat in contrast to the foregoing social and ethical discussions. Chris GoGwilt considers the ways in which Romanized print form conveys the Malay of Almayer’s Folly, the Cyrillic of Under Western Eyes and the Polish of “Prince Roman” through the concepts, respectively, of transcription, transliteration and translation. GoGwilt intriguingly finds in “Prince Roman” “a solution of sorts to the linguistic riddle presented by the earlier two examples” (124), because – as he shows us in detail – the “print form” of the story “reveals the irreducible plurality of Romanisation that makes Romanised print form the site of multiple, overlapping, and contested languages, cultures and histories” (126), a complexity of interconnection that the volume as a whole advances as matter for celebration. Andrew Francis sticks to the linguistic complexities of the Malay fiction, and the reader will learn much from his precise and learned historical account. Francis is open to the “numerous occasions in which the [linguistic] tables are turned, so to speak, on the Europeans in the Malay fiction” (142), and gives a fine reading of the entertaining English of the master of Stein’s brigantine in Lord Jim, and also of Marlow’s “colonial attitudes” and “disdainful amusement” (140). Reaching a very different end-point from GoGwilt, Francis documents how in Conrad’s fiction, “colonialism could work its process of dispossession not only on the colonized but on the colonizer” (145). Claude Maisonnat moves us back to Europe and to the other end of Conrad’s fiction. In his discussion of Gallicisms he maintains a welcome and extended focus on The Rover, in which he finds “nearly two hundred French phrases quoted verbatim and nearly a hundred linguistic Gallicisms” (167). In his close discussion of some of these, Maisonnat acknowledges several other commentators upon Conrad’s Gallicized English, both to agree and to disagree; his own contribution is to insist, and then to demonstrate, that such Gallicisms “cannot be considered as pure mistakes, being actually part and parcel of Conrad’s writing strategies” (160). Several examples from The Rover show how French introduces “alterity into the master language of the novel” (164), such that Gallicisms “tend to give a spectral dimension to the narrative as they conjure up another text that remains silent but is mostly present in the mode of absence” (165). A tricky formulation, perhaps, but it shines a very interesting light on a novel generally thought of as rather simple in its strategies and attitudes. This is a note taken up in a very different way by Andrew Purssell, who sees A Personal Record as Conrad’s resistance to being categorized, and reminds us of the “distinctly polyphonic, cosmopolitan space” (170) of the British Merchant Service in which Conrad learned so much of his English. Purssell explores various ways in which Conrad “writes himself into the sign systems of his adopted country” (171), though the essay is carried forward by an implicit questioning of the “air of inevitability” in Conrad’s account of linguistic adoption: “Indeed, A Personal Record is less about the retrospective imposition of pattern and order than a reassertion … of the facility with which Conrad … self-consciously constructed the phenomenon known as ‘Joseph Conrad’” (173). Purssell is clear that “what matters is not the ‘facts,’ but that Conrad chooses to present them as such, and this includes his relationship with English” (174), and this joins his essay to a major issue which shadows much of this volume – the referential and truth-bearing quality of language in the hands of a writer so wedded to, and yet so sceptical of “facts,” a writer who praises “technical language” (in The Mirror of the Sea) yet who is continually beset by doubts as to the capacity of language to convey the facts of existence. The essay which most nearly takes on these issues directly to give an account of Conrad’s braced, forcible language – and the most enjoyable essay of the book – is that by John Attridge on “Conrad, G. E. Moore and Idealism.” Attridge takes Moore’s 1903 essay “The Refutation of Idealism” as a starting point from which to explore Conrad’s similarly sceptical scrutiny of abstract terms, and “his desire to refurbish this faded vocabulary [of political discourse] using the sensory concreteness of impressionist style” (44). Showing in some detail how “Both Conrad and Moore use a jolt of phenomenology to defibrillate the ‘old, old words’” (48), Attridge goes on to examine with delicacy the empiricist tendency in Conrad’s praise of the “technical language” just referred to, in the exposure of the sham of Kurtz’s eloquence, and, as a letter-writer, his various rebuffs to Cunninghame Graham’s political idealism. Yet he does not ignore that “another, more abstract register” has often been detected in Conrad’s work. The second half of Attridge’s essay discusses “the basic opposition between the material and the metaphysical worlds” (53) in terms of the attitudes to eloquence and to ideals ironically displayed in Under Western Eyes and Nostromo. While acknowledging the Goulds’ need, so brilliantly exposed by Decoud, to re-enchant the material world, Attridge is keen to observe that their relative taciturnity on political matters is to be distinguished from the rhetoric of their ally Don José Avellanos as “a rejection of linguistic idealism” (59). Attridge clearly re-asserts the fundamental empiricist tenet of his essay in writing near his conclusion that “Moore’s insistence that philosophical words and sentences should have a sharply defined meaning is comparable to Conrad’s preference for words that have an authentic reference – albeit a reference to the speaker’s ‘own sensations’” (60). Grateful as we should be for this very good essay, Conrad and Language lacks the thoroughgoing examination of Conrad’s linguistic scepticism that the Introduction promises when it proposes to address “‘an awakened philosophical curiosity about language’ that included a questioning of the relation of words and things and a recognition of language’s approximate representation of reality” (6/7). One place to start, perhaps, would be a comparison of Conrad’s expressed views and actual fictional practice with the linguistic philosophy of his slightly older contemporary, Fritz Mauthner (1849–1923). Mauthner has a similarly sceptical view of “the essential inadequacy of language for the knowledge of the world,” and a Conradian sense of the operations of language between perception and perceived object: “It is only language which makes us split and double the world into the adjectival and the substantive world, which makes us speak of things apart from their properties.” Equally, one of the best modern extended discussions of language in Conrad is that by Geoffrey Galt Harpham in Part Three of One of Us (1997), called “To Write in English,” but it is only Claude Maisonnat, in this volume, who refers to it. 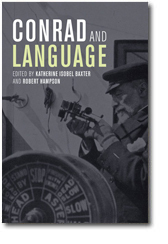 The strengths and weaknesses of Conrad and Language are part and parcel of the increasingly prevalent genre to which it contributes, the edited collection of a variety of essays, which promotes a range of voices and positions to be heard on a common topic. There are good bits to be found everywhere in this book; each one of its contributors offers sophisticated understanding, reads subtly, writes with clarity, has worthwhile things to say. But this remains a collection of bits, from which to draw a swift insight, that would enliven teaching perhaps, or to put in a footnote as evidence of up to date reading. There isn’t an invitation here to become immersed in one way of reading Conrad – in fact such a collection is ideologically opposed to that sort of monologic endeavour, and places a high value on brief utterance from a variety of angles. The two final essays seek more consciously to promote a “Conrad for our times” than the previous contributions. In “The Russian Redemption of The Secret Agent and Under Western Eyes,” Ludmilla Voitkovska writes in celebration of “events of extraordinary significance for Russian Conradian scholarship” (186) – the translations of these two novels in a single scholarly volume in 2012. Taking full account of the previous poverty of Russian readings of these novels, Voitkovska nevertheless details over several forensic pages how “Conrad relies on the early twentieth-century British perceptions of Russian culture and Russian people reflected in myths, distorted ideas, clichés and absurd and grotesque stories” (191). She extends this to a historical account of how translators have dealt with Conrad’s representation of Russian language which is particularly useful in revealing to the Western reader how Russian readers might actually feel in reading Conrad. Yet her overall judgment is that this joint volume of translations “invites Russian critics … to recognize that there is value in Conrad’s strength of conviction and his personal honesty” (202). In his “Afterword,” Laurence Davies continues this dialogue which “speaks at a time of remapping Anglophone literatures” (204) in the light of new debates about globalized culture, migration, borders and cultural privilege. He asks why Conrad is so worth framing in these contexts, and answers “To begin with, there is the phenomenon of his linguistic formation” (204). Davies recalls and extends the previous contributions, and draws them into the “swirl” which he sees as characterizing current literary cross-cultural encounters. I only wish his essay had been longer. English is not my mother tongue, not even remotely. It is in fact something far more valuable: a language I was lucky enough to be able to choose, after not finding a home in any of my other linguistic shelters. It is a borrowed language, a gift and a treasure. Had it not come my way, at just the right moment in my life, I would have lived bereft. I would have settled on another profession, and my lack of an inner anchor would have been marked by some measure of professional success in a job not defined by writing. Would it have mattered? Yes!